Normal urine is sterile. 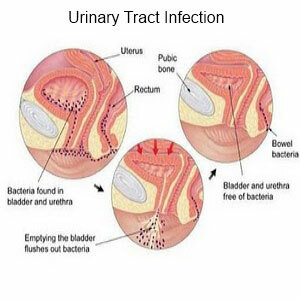 When bacteria enters the urinary system it is called urinary tract infection. Common in children, middle and elderly people. Pyeolephritis means infection affecting the kidneys. Cystitis means infection affecting urinary bladder. Analysis of a urine sample to check for white blood cells, red blood cells or bacteria. Full assessment of the cause of the problem and effective treatment of underlying condition is essential.